In the centuries leading up to the New Kingdom of Egypt that rose in 1500 BCE, many kingdoms in the region warred with each other. Now archaeologists have discovered evidence of one of these lost kingdoms, complete with the tomb of one of its leaders. Pharaoh Senebkay ruled a kingdom that existed centuries before Egypt became the powerful empire that we associate with the reign of legendary pharaohs like Ramses the Great. His dynasty would have struggled against other factions to control the vast fertile regions that bordered the Nile River and Red Sea. In these hieroglyphs, we see the phrase "Son of Re, Senebkay." University of Pennsylvania's Josef Wegner, an archaeologist, was excavating the nearby tomb of another king, Sobekhotep, when he and his team stumbled on Senebkay's tomb. We discovered an unknown king plus a lost dynasty. It looks likely that all of the 16 kings are all buried there. ... We now have the tomb for first or second king of this dynasty. There should be a whole series of the others. Tomb robbers had stripped it, but it still had the prescription of Sobekhotep on the wood. The fact that they were reusing wood would suggest that it was relatively soon after the earlier tomb of Sobekhotep. Where there are king's tombs, there are also queen's tombs, and tombs of high officials of the royal court. The discovery has given an interesting look at a period of fragmentation and political conflict, struggling with rival kingdoms of the north and south. 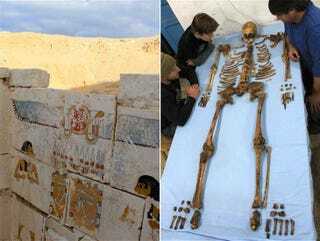 He said that he would be returning to the area next year for further excavations.